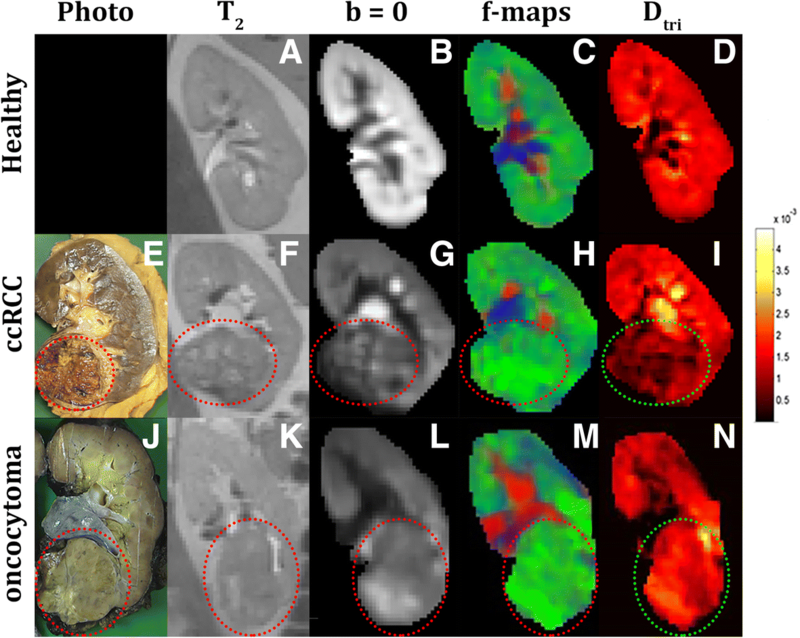 To compare diffusion tensor imaging (DTI), intravoxel incoherent motion (IVIM), and tri-exponential models of the diffusion magnetic resonance imaging (MRI) signal for the characterization of renal lesions in relationship to histopathological findings. Sixteen patients planned to undergo nephrectomy for kidney tumour were scanned before surgery at 3 T magnetic resonance imaging (MRI), with T2-weighted imaging, DTI and diffusion weighted imaging (DWI) using ten b-values. DTI parameters (mean diffusivity [MD] and fractional anisotropy [FA]) were obtained by iterative weighted linear least squared fitting of the DTI data and bi-, and tri-exponential fit parameters (Dbi, fstar,and Dtri, ffast,finterm) using a nonlinear fit of the multiple b-value DWI data. Average parameters were calculated for regions of interest, selecting the lesions and healthy kidney tissue. Tumour type and specificities were determined after surgery by histological examination. Mean parameter values of healthy tissue and solid lesions were compared using a Wilcoxon-signed ranked test and MANOVA. Thirteen solid lesions (nine clear cell carcinomas, two papillary renal cell carcinoma, one haemangioma and one oncocytoma) and four cysts were included. The mean MD of solid lesions are significantly (p < 0.05) lower than healthy cortex and medulla, (1.94 ± 0.32*10− 3 mm2/s versus 2.16 ± 0.12*10− 3 mm2/s and 2.21 ± 0.14*10− 3 mm2/s, respectively) whereas ffast is significantly higher (7.30 ± 3.29% versus 4.14 ± 1.92% and 4.57 ± 1.74%) and finterm is significantly lower (18.7 ± 5.02% versus 28.8 ± 5.09% and 26.4 ± 6.65%). Diffusion coefficients were high (≥2.0*10− 3 mm2/s for MD, 1.90*10− 3 mm2/s for Dbi and 1.6*10− 3 mm2/s for Dtri) in cc-RCCs with cystic structures and/or haemorrhaging and low (≤1.80*10− 3 mm2/s for MD, 1.40*10− 3 mm2/s for Dbi and 1.05*10− 3 mm2/s for Dtri) in tumours with necrosis or sarcomatoid differentiation. Parameters derived from a two- or three-component fit of the diffusion signal are sensitive to histopathological features of kidney lesions. As a result of the increased use of abdominal imaging, more (asymptomatic) small (≤ 4 cm) renal masses are incidentally discovered. In a series of 173 patients only 58% of kidney tumours < 4 cm were malignant, whereas all kidney tumours > 7 cm were . Hence, a substantial amount of incidentally discovered renal masses is not malignant [2–4]. The management of renal lesions includes radical or partial nephrectomy, minimal invasive ablative techniques or active surveillance. Because of concern for chronic kidney disease, nephron sparing surgery is preferred [5, 6] but more importantly unnecessary surgery should be avoided. One way to realize this is by distinguishing between lesion types and reliably diagnosing benign tumour types, such as oncocytoma, prior to treatment . However, with currently available clinical imaging modalities, benign renal masses are indistinguishable from malignant renal masses [4, 8]. Many magnetic resonance imaging (MRI) techniques have been explored as methods to differentiate between benign and malignant renal lesions or between renal cell carcinoma (RCC) subtypes [4, 9–11]. One promising technique is diffusion-weighted imaging (DWI), which allows quantification of water motion in tissues without administration of exogenous contrast materials [12–16]. The apparent diffusion coefficient (ADC), derived from a mono-exponential model, is believed to reflect tissue cellularity as a higher tissue density will amount to more restricted diffusion, hence a lower diffusion value. However, ADC values for different subtypes may overlap, making determination of cut-off values to distinguish between benign and malignant solid renal masses problematic . More complex models of diffusion, such as the diffusion tensor model (DTI) and the intravoxel incoherent motion model (IVIM), allow deriving additional information. DTI-derived parameters fractional anisotropy (FA) and mean diffusivity (MD) have been correlated with histological parameters such as cell density and nuclear grade . The IVIM model is a bi-exponential model that includes molecular diffusion and microcirculation of blood in the capillary network (‘pseudodiffusion’) . A combination of pseudodiffusion fraction fbi and the perfusion-free diffusion coefficient Dbi from IVIM model is able to differentiate between renal tumour types [20, 21]. Recently, the IVIM model was expanded to a three-component model by adding an additional component that accounts for intermediately fast water motion in the kidney [22, 23]. The aim of this study is to compare parameters obtained from DTI, intravoxel incoherent motion (IVIM), and tri-exponential models of the diffusion signal of kidney lesions, for the characterization of renal lesions. Because tumours are usually not uniform and may consist of several areas with different structural patterns, we compare diffusion parameters with histopathological results. Approval of our institution’s ethical committee was obtained for this prospective study and all subjects provided written informed consent. From March 2016 to May 2017, sixteen patients (11 male, age 65 (range 50–76) years old, 5 female, age 60 (range 48–72), total group: age 64 (range 48–76) years old) who had suspected kidney tumours and were planned to undergo radical or partial nephrectomy based on standard clinical diagnostic criteria were included. After including the first five consecutive patients, patients were also selected on tumour size (≤ 4 cm on radiologic examination) in order to increase chance of including benign solid lesions. After surgical resection of the tumour, kidney tumour type was determined according to the WHO classification of tumours of the urinary system  by histopathological examination of 2-μm-thick sections of formalin-fixed and paraffin-embedded tumour tissue blocks using haematoxylin-eosin (HE) staining. A T2 weighted sequence was performed for anatomical reference, followed by a DTI sequence (b = 0, 100 and 300 s/mm2 in 15 gradient direction) and a DWI sequence including ten b-values (b = 0, 10, 25, 40, 75, 100, 200, 300, 500 and 700 s/mm2 in six gradient directions) on a 3 T MRI clinical scanner (Philips, Ingenia, Philips Healthcare, Best, The Netherlands), see Table 1 for MRI acquisition details. To enable accurate parameter fitting all scans were corrected for (breathing) motion before further processing. Due to differences in motion between the right and left kidneys, they were cropped and processed as separate data sets, as described previously . All pre-processing was performed using diffusion imaging analysis package DTItools [github.com/mfroeling/DTITools]  and image registration toolbox Elastix [http://elastix.isi.uu.nl/] . First, T2 scans were processed to correct for slice by slice misalignment due to acquisition in multiple breath-holds using a rigid 2D registration algorithm after being resampled to 2 mm isotropic using a single interpolation method. Finally, all DWI data was corrected for breathing motion, by registering them to the unweighted volume using a rigid 2D b-spline registration algorithm after which the DWI data was registered to the reference T2 scan using a 3D affine registration algorithm . From the DTI data the FA and MD were calculated using an iterative weighted linear least squares algorithm with outlier rejection using ExploreDTI . From the IVIM data, bi- and tri-exponential diffusion decay parameters, i.e. the mean diffusion (Dbi for bi-exponential and Dtri for tri-exponential fitting), and the signal fraction attributed to pseudo-diffusion (fstar for bi-exponential and ffast and finterm for tri-exponential fitting), were obtained by fitting a two and three-component model to the multiple b-value DWI data, as described previously [22, 23]. To make a comparison between the DTI and IVIM data, the mean diffusion from a mono-exponential fit, Dmono was also obtained. Regions of interest (ROIs) to segment the tumour volumes were manually defined on the combined T2 and DWI data by the principal researcher (S.v.B., 4 years of experience) in agreement with an experienced radiologists (C.K., 12 years of experience) using image segmentation toolbox ITK snap . ROIs were placed inside the tumour, rather than following the contour, to limit the contribution of the signal from other tissue types due to partial volume effect or imprecise image registration. For comparison of tumour tissue with healthy kidney parenchyma, the cortex and medulla in the healthy contralateral kidneys were segmented using an automated algorithm as in . The mean and standard deviation of the diffusion parameters were obtained for healthy cortex and medulla and lesion ROIs. 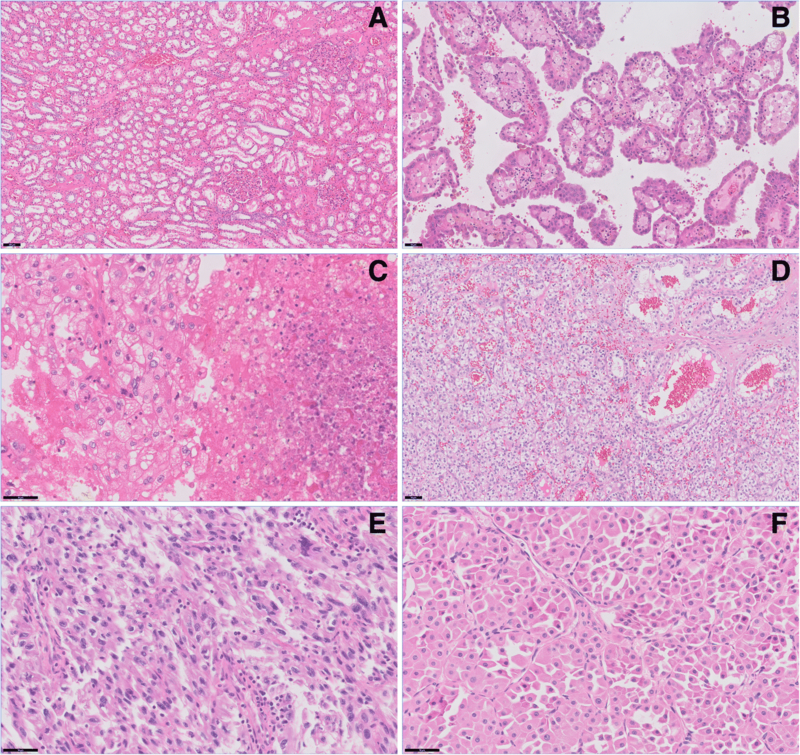 Parameter maps MD, Dbi, Dtri, fstar, ffast and finterm were obtained for visual comparison with T2 and (if available) photographs of the gross appearance of the resected kidney tumours before histological examination. All statistical tests were performed using SPSS (version 23.0. Armonk, NY: IBM Corp.). Healthy cortex and medulla were compared with all solid lesions using a Wilcoxon Signed Ranks test. The means of parameters MD, FA, Dbi, Dtri, fstar, ffast and finterm in healthy cortex and medulla, different types of RCCs, cysts and benign solid lesions were compared using multivariate analysis of variance (MANOVA). Bonferroni correction was applied, and a p-value < 0.05 was considered significant for all statistical tests. All patients were successfully scanned. One scan was removed before processing due to artefacts resulting from a lower-back implantation. After visual inspection following processing two other scans were removed, due to poor motion correction results and an error in the data. In the remaining thirteen scans, thirteen solid lesions (average size of maximum diameter, determined by histopathological examination 3.85 cm, range 0.8–7.5 cm) and five fluid-filled cysts were found. Examples of the raw acquired data and the data after motion correction and image registration together with the ROI placement in one lesion are shown in Fig. 1. Of the solid lesions, eleven were considered to be malignant (nine clear cell RCCs (cc-RCCs), two papillary cell RCCs (p-RCCs) and two were considered to be benign (one haemangioma of the kidney capsule and one oncocytoma). Of the nine cc-RCCs, only one had a homogeneous microstructural pattern consisting mainly of clear cells. Others had considerable amounts of necrosis, sarcomatoid differentiation, haemorrhaging or deviating growth patterns such as papillary, tubular or cystic growth. In Fig. 2, histopathological features of several kidney tumour tissues are displayed. 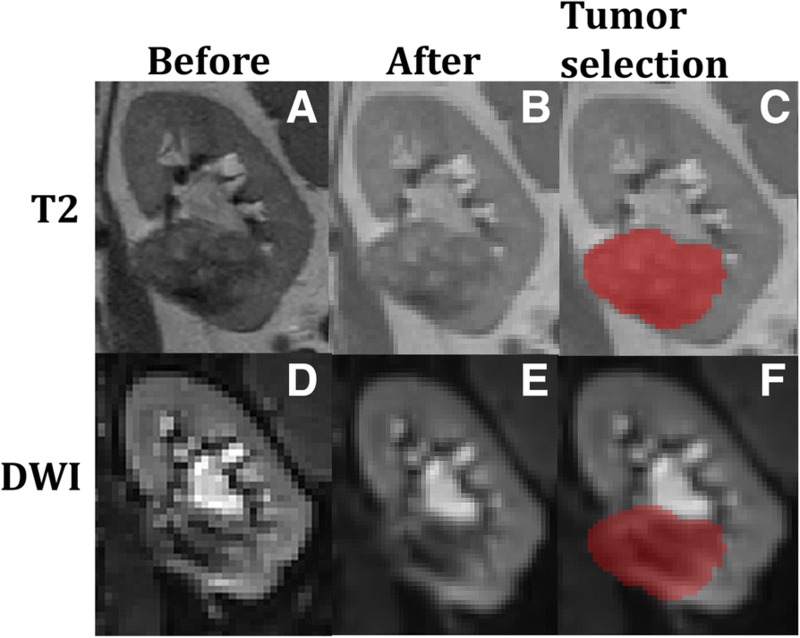 Figure 3 shows MRI data (T2 and DWI b = 0) parameters maps and (where available) photographs of the gross appearance of the resected kidney tumours for: a contralateral unaffected kidney (A-D), a case of cc-RCC (E-H) and the oncocytoma (I-L). In the Additional file 1: Figure S1 the gross appearance, MRI data and parameter maps of all tumour types are shown. The fractions of the diffusion components are shown as merged f-maps where ffast, finterm and fslow are colour coded red, blue and green, respectively. For the unaffected kidney, ffast (red) was high in those areas with a high blood flow (e.g. large blood vessels) whereas finterm (blue) was high in areas with free water (e.g. the pyelum). The diffusion coefficient (Dtri) was homogeneous throughout healthy kidney parenchyma. Upon visual examination, in the maps obtained in a cc-RCC, Dtri was lower throughout the tumour, and fslow had a high contribution. For the oncocytoma, the lesion did not seem much different from normal kidney parenchyma, although fslow and Dtri appeared higher. In the p-RCC, the merged f-maps showed a small contribution from ffast and a larger contribution from fslow. The Dtri map indicated a low diffusion coefficient. In the cc-RCC with sarcomatoid differentiation and the cc-RCC with papillary growth the photographs and the diffusion parameter maps showed a more heterogeneous make-up, indicating a more complex tumour. In the cysts, fslow had a high contribution and Dtri was high. For the haemangioma, fslow and Dtri appeared higher. The mean and standard deviations of parameter values of grouped lesions and measurements of healthy cortex and medulla are given in Table 2. In Additional file 2: Figure S2 Dmono is plotted against MD for each lesion. In Additional file 3: Table S1, the values for Dmono are displayed together with the other diffusion coefficients MD, Dbi, and Dtri. MD and Dmono have a similar order of magnitude for each (group of) lesion, whereas Dbi and Dtri are structurally lower. Solid lesions had a significantly lower MD (1.94 ± 0.32 10− 3 mm2/s) than healthy tissue (2.16 ± 0.12 10− 3 mm2/s for cortex, p = 0.019 and 2.21 ± 0.14 10− 3 mm2/s for medulla, p = 0.009) and a significantly lower (p = 0.023) Dbi (2.02 ± 0.11 10− 3 mm2/s) than healthy medulla (1.71 ± 0.43 10− 3 mm2/s), but no significant difference in Dtri. MD, Dbi and Dtri were all significantly higher (p < 0.002) in cysts than healthy tissue and other lesions (see Table 2). Compared to healthy tissue (0.38 ± 0.09 for cortex and 0.39 ± 0.08 for medulla), FA was higher in all solid lesions (0.47 ± 0.11), RCCs (0.46 ± 0.10) and benign solid lesions (0.48 ± 0.19) but similar in cysts (0.37 ± 0.11), however these differences were not significant. fstar did not show significant differences between healthy tissue (10.1 ± 2.58% for cortex, 9.69 ± 2.90% % for medulla), and solid lesions (11.6 ± 3.88%). finterm was significantly higher in healthy tissue (28.8 ± 5.09% for cortex and 26.4 ± 6.65% for medulla) than solid lesions (18.7 ± 5.02%, p = 0.003 for cortex, p = 0.011 for medulla) and RCCs (18.3 ± 5.35%, p = 0.000 for cortex, p = 0.009 for medulla). ffast was a significantly lower for healthy tissue (4.14 ± 1.92% for cortex, p = 0.009, and 4.57 ± 1.74% for medulla, p = 0.033) than all solid lesions (7.30 ± 3.29%), and healthy cortex had a significantly lower ffast than RCCs (7.21 ± 2.88%, p = 0.034). Cysts had a significantly lower fstar (1.88 ± 1.60%) than healthy tissue (p = 0.000 for cortex, 0.001 for medulla), RCCs (11.6 ± 3.45%, p = 0.000) and benign lesions (11.6 ± .83%, p = 0.009), a significantly lower finterm (8.31 ± 2.02%, p = 0.034) than RCCs and a significantly lower ffast (1.18 ± 1.70%) than RCCs (p = 0.001) and benign solid lesions (7.76 ± 6.75%, p = 0.030). Parameter values separated according to tumour type are given in Table 3, together with values for individual heterogeneous RCCs. There was a large variation in all parameters among the cc-RCCs. Diffusion coefficients were high (≥ 2.0*10− 3 mm2/s for MD, 1.90*10− 3 mm2/s for Dbi and 1.6*10− 3 mm2/s for Dtri) in cc-RCCs with cystic structures (see Fig. 2d for microscopic photograph) and/or haemorrhaging and low (≤ 1.80*10− 3 mm2/s for MD, 1.40*10− 3 mm2/s for Dbi and 1.05*10− 3 mm2/s for Dtri) in tumours with necrosis (Fig. 2c) or sarcomatoid differentiation (Fig. 2e). fstar and ffast is high (16.62 and 12.43% respectively) in a tumour with extensive haemorrhaging, and low (≤ 11% for fstar and ≤ 6.5% for ffast) in tumours with cystic structures and/or necrosis. finterm is particularly high in a cc-RCC with micro-cystic structures and haemorrhaging. The haemangioma had the highest diffusivity in all models (2.38*10− 3 mm2/s for MD, 2.45*10− 3 mm2/s for Dbi and 1.99*10− 3 mm2/s for Dtri). Additionally, the haemangioma had the highest FA (0.61). The oncocytoma (Fig. 2f) had the highest fstar (17.1%) and ffast (12.5%), although the cc-RCC with papillary growth had a comparable fstar (16.5%). The cysts and haemangioma had a low fstar (7.95 and 6.06%, respectively) and ffast (2.83 and 2.99% respectively). finterm was in the range of 19–23% except for p-RCC (16%) and cysts (32%). In Fig. 4, each lesion is represented by a dot in the scatter plot, plotting DTI parameters MD versus FA (Fig. 3a), IVIM parameters Dbi versus fstar (Fig. 3b), three-component parameters Dtri versus finterm (Fig. 3c) and Dtri versus ffast (Fig. 3d). Cysts were recognizable by a high MD, Dbi and Dtri, but they were more grouped in Dtri versus finterm/ffast due to a consistently low finterm and ffast. In Dbi versus fstar and Dtri versus ffast several general groupings were identifiable; the cysts are located in the lower right corner, the cc-RCCs in the middle and p-RCC (Fig. 2b for microscopic photograph) in the middle to the left. The oncocytoma is located above the cc-RCCs and the haemangioma between cc-RCCs and the cysts. However, one of the cc-RCCs is closely located to the oncocytoma due to a high value of fstar and ffast. The p-RCCs and cc-RCC with sarcomatoid differentiation seemed to have a slightly lower Dbi and Dtri than most cc-RCCs, but one cc-RCC has a much lower diffusivity than all other lesions. Figures 5 and 6 show box plots for MD (Fig. 5a), Dbi (Fig. 5b), Dtri (Fig. 5c), FA (Fig. 6a), fstar, (Fig. 6b), ffast (Fig. 6c) and finterm (Fig. 6d). The finterm and ffast show more pronounced differences and less overlap between individual lesions than fstar. and compared to MD, both Dbi and Dtri gave more pronounced differences and less overlap between tissue types. In this study, we have compared the DTI, IVIM and three-compartment models of the diffusion signal for the characterization of renal lesions. In the study population of sixteen patients who received radical or partial nephrectomy, two lesions were found benign upon histological examination. This indicates that resection was unnecessary and could have been prevented if these lesions were identified as non-malignant prior to surgery. Based on our results the haemangioma could potentially have been identified using diffusion-derived parameters, notably, a high Dbi and Dtri and a low fstar and ffast. Previous studies applying DWI to evaluate kidney tumour type concluded that kidney lesions generally have a lower ADC than normal kidney tissue [13, 17, 29] and some studies also found a higher mean ADC value in benign lesions than in malignant lesions [15, 30, 31]. Studies typically find a higher ADC in oncocytomas than in RCCs [12–15, 17, 30–32] and therefore, ADC is likely to be a valuable parameter in evaluating tumour type. However, in itself it is not sufficient as a clinical index due to overlap in values between tumour tissue types [16, 17, 33]. In line with previous studies MD in this study was significantly lower in solid lesions than in healthy tissue, and RCCs had a lower MD than benign lesions and cysts. Differences in diffusivity between tissue types are usually attributed to differences in tissue cellularity, a higher cellularity will result in more restricted diffusion and therefore, more aggressive lesions are expected to present with a lower diffusivity [15, 21]. Our study also showed similar results: cysts had the highest diffusion coefficients whereas lesions with a high degree of necrosis had low diffusivity, which we have assigned to an increase in with a diffusion-restricting elements, such as macromolecules, and disorganisation. In the two-component IVIM model, a fast moving component is separated from the diffusion signal, resulting in a lower diffusion coefficient Dbi. The fraction fstar of the diffusion signal that is attributed to fast moving water has been correlated to renal tumour vascularity . As in this study, a lower MD and Dbi for p-RCC than cc-RCC and similar values for fstar in p-RCCs were found previously . A tri-exponential fit of the diffusion signal in the kidney was previously shown to provide additional information on structures associated with pseudodiffusion by separating the fast from intermediate pseudodiffusion resulting in signal fractions finterm associated with a diffusion rate in the order of magnitude of free water and ffast associated with perfusion [22, 23], and comparable values to this study for parameters derived from DTI, two- and three-compartment fitting for healthy cortex and medulla were reported . MD was the only diffusion coefficient to be significantly different in healthy tissue from RCCs but within the tumour type groups the MD range was wider whereas the differences between tumour types were more pronounced in Dbi and Dtri,. Because diffusion coefficients Dbi and Dtri exclude the fraction of the diffusion signal that is attributed to fast water movement, they were lower but more precise than MD. Therefore, Dbi and Dtri better reflect tissue diffusion, making both these parameters more specific for tissue cellularity. However, none of the diffusion coefficients could be used to reliably distinguish between lesion types, as diffusion coefficients overlap. For a better contrast between lesion types, tissue cellularity (MD, Dbi or Dtri) can be combined with a measure for vascularisation (fstar or ffast). For example, a combination of Dbi and fstar was previously shown to discriminate between renal tumour subtypes . There was a large variation in diffusion parameter values between individual cc-RCC tumours due to tumour heterogeneity and differences in microstructural make-up. In addition, drawing statistical inferences from this study is limited due to the small number of cases and the sensitivity of the analysis to outliers. 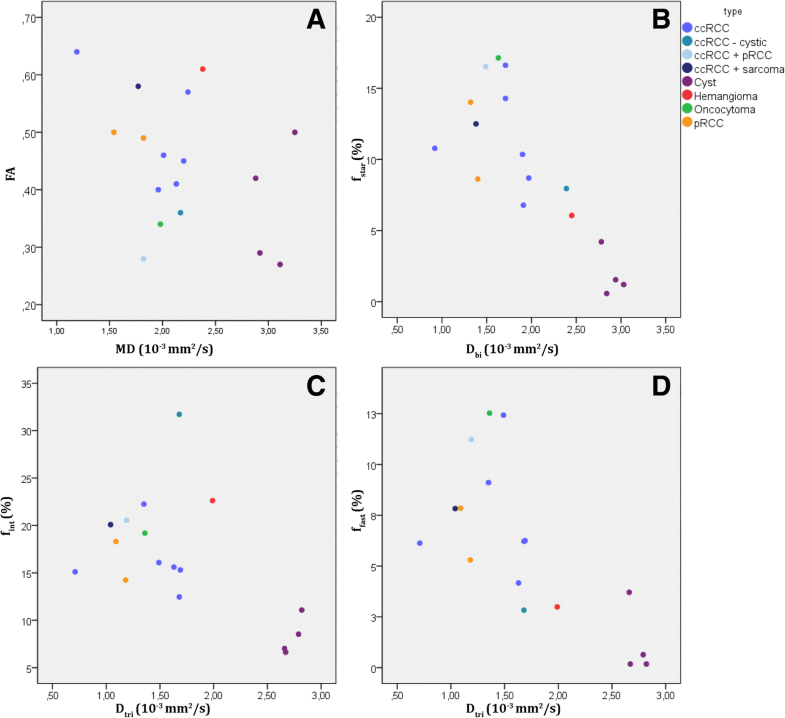 Therefore we have also analysed the results from individual lesions, associating histopathological characteristics with the interpretations of diffusion parameters outlined above. In this analysis, low diffusion coefficients were found in cc-RCCs with a high tissue density (due to extensive necrosis or sarcomatoid differentiation) whereas high diffusion coefficients were found in cc-RCCs with cystic structures. Additionally, tumours with a high perfusion rate are characterized by a high value of fstar or ffast whereas tumours with a low perfusion rate, such as the haemangioma, cysts and the cc-RCCs with cystic structures have lower fstar or ffast. Hence, these diffusion parameters seem to be indicative of histopathological features of kidney tumours. Although both fstar and ffast seem to correlate to vascularisation, only the three-component parameters ffast and finterm show significant differences between different tissues whereas two-component parameter fstar does not, showing that the tri-exponential model provides additional information over the bi-exponential model. Because of the limited amount of cases it is impossible to formulate conclusions regarding the characterisation of kidney tumour type. Therefore, we have also analysed individual lesions relating our findings to histopathological details. The initial results from this analysis indicate that diffusion parameters are sensitive to histopathological features of kidney lesions, which is a first step towards non-invasive characterisation of these lesions prior to treatment. An improvement to this study would be to spatially correlate histopathology to parameter measurements and maps . This would result in more specific validation of diffusion parameters, confirming the correlation between diffusion parameters to histopathological features of tissues, such as cellularity, perfusion and cystic structures. In addition, to establish what parameter values should be used to confidently distinguish between benign and malignant lesions and draw statistically significant conclusions, a larger study population should be included. However, since kidney tumour type is unknown before histopathological evaluation, researchers have no control over which tumour types are included. To increase the amount of benign kidney tumours, only small (≤ 4 cm) renal masses (about 40% benign ) can be included. Additionally, this study shows that parameters derived from the DTI sequence (MD and FA) do not provide additional information over parameters derived from a multiple b-value sequence (from two- and three- component fits). Hence, the DTI sequence can be omitted, decreasing total scanner time with one third, to about 30 min. In conclusion, parameters derived from a two- or three-component fit of the diffusion signal are sensitive to histopathological features of kidney lesions. We are grateful to all the patients who have participated in this study. We thank Casper Jansen for histopathological support, Aletta Goolkate-Geerlig for technical support. The approval received by our local ethics institution does not allow for making data and material available. All authors listed have contributed sufficiently to the project to be included as authors, and all those who are qualified to be authors are listed in the author byline. All authors read and approved the final manuscript. This study was approved by our local institutional review board and written informed consent was given by all subjects. All authors consent to publish this research.